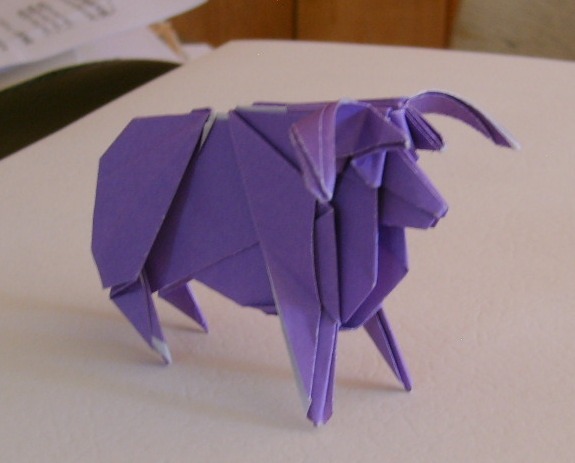 This is a photo of the origami gnu-like model I took to the “Money-less Yard Sale on September 6th. I may try another with horns curling upwards as in the GNU logo. Ted P.
origami gnu – well sort of. After the problems I had making good dvd’s of various iso’s I have acquired a desktop pc with 64 bit capacity. Just need to install an OS and get a good dvd internal burner. Addendum 09-24-14: I have installed Xubuntu 14.04.1 (64 bit) and the machine runs well. I have two iso’s and will download more, adding Trisquel as recommended for new users. The dvd burner just arrived and I will install it soon. I will let the group know how it is going at our next meeting.